AC Milan lost again today. 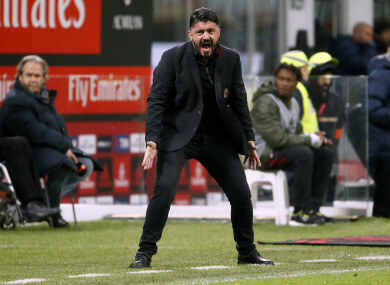 AC MILAN HEAD coach Gennaro Gattuso has rejected suggestions he could quit, claiming he is the least of the club’s problems after the team suffered a 2-0 loss at home to Atalanta. Gattuso replaced the sacked Vincenzo Montella late last month but has only managed one Serie A victory, a 2-1 win over Bologna, from his four league games in charge. Last weekend the Rossoneri were surprisingly beaten 3-0 by struggling Verona and they were second best again on Saturday at San Siro, where Bryan Cristante and Josip Ilicic sealed all three points for Atalanta. Speaking to Mediaset Premium, Gattuso insisted walking away after less than a month in charge was not the solution. “Many things didn’t work, though at the start we had the right approach. Once we went behind, it turned into an uphill struggle,” he said. “It’s a complicated situation, the fans are protesting and we can’t think of continuing the season like this. But I don’t see people holding back or not trying to give their best. I see people who give their all, but evidently we are fragile. “Today I am the Milan coach, but I am the least of our problems. It’s not just about fitness levels, but here is also the psychological component. When what we are doing is not enough, we must become a team and to do that we need to make fewer mistakes. Gattuso won both Serie A and the Champions League twice during his time as a Milan player, but the former Italy international feels memories of the club’s great teams of the previous three decades are not helping the current squad. “We lack determination, hunger and grit,” he said. “I also think we should stop making comparisons with the past. There were different players and a different club. “We have to focus on the present, a present full of difficulties which we must all find a way out of together. Email “Gattuso: I am the least of Milan's problems”. Feedback on “Gattuso: I am the least of Milan's problems”.